(Wilmington, Delaware, April 4, 2019). Today, Larry Klayman, the founder of Judicial Watch and Freedom Watch, and a former prosecutor of the U.S. Department of Justice, announced the filing of a lawsuit for the most sexually abused and criminally harmed of all of the women at Fox News by its former founder and CEO Roger Ailes. The complaint is embedded below and can also be found at www.larryklayman.com. This complaint was filed against Showtime and Blumhouse Productions and their writer Gabriel Sherman. These Hollywood companies are producing and now filming an eight-part miniseries about Roger Ailes titled "The Loudest Voice in the Room," which includes as one of its principal subjects Laura Luhn, as played by Hollywood actress Annabelle Wallis. 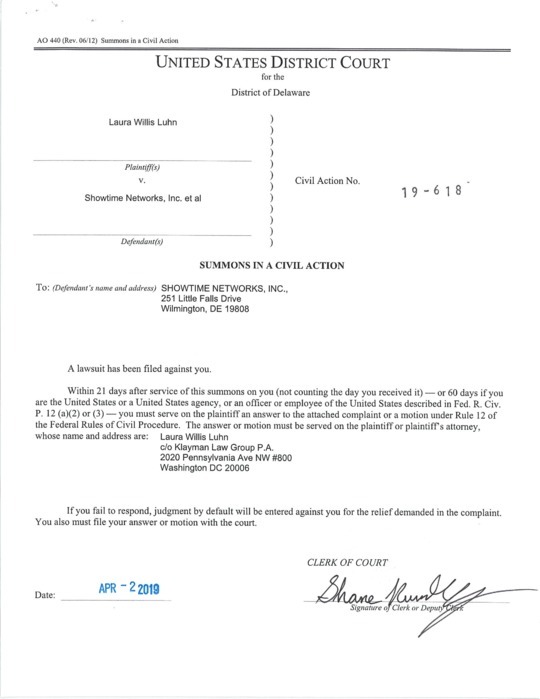 It asks for over $750,000,000 million dollars, which includes treble and punitive damages, for violations of the Lanham Act among other counts, based on the misuse and misappropriation of the likeness and being of Ms. Luhn, without compensation. Moreover, based on a prior article written by Gabriel Sherman, it is believed that the rendition of Ms. Luhn will be defamatory and inaccurate at the least. Importantly, the complaint, the facts of which are sworn to under oath, under penalty of perjury, by Ms. Luhn, directly contradicts a wholly inaccurate "fluff piece" which was published yesterday by reporter Stephen Battaglio of the Los Angeles Times tilted "Fox News Executive Suzanne Scott Keeps Her Focus on Winning" (April 3, 2019). In this article Battaglia, taking it "hook, line and sinker" quoted Ms. Scott as saying "I felt devastated for the women who work here... I wanted to do everything I could to heal this place." Battaglio then added: "In some of those discussions (with women), it was necessary for Scott to tell employees she had no knowledge of Ailes' behavior even though she was part of his inner circle." In fact, as set forth in the Luhn complaint, this is patently false! Ms. Scott knew of Ailes' sexual abuse and criminality, but covered it up and continues to cover it up. Undoubtedly as a "good soldier," she ultimately was rewarded by the Murdochs with Ailes' position when he was forced out of Fox News when the sexual abuse became public at the time that Gretchen Carlson sued the network over her sexual harassment. "I am a proud conservative and as the founder and head of Judicial Watch during the early years of Fox News, I played a big role in helping to build the network through my appearances over the government scandals my group had uncovered and prosecuted, particularly involving the Clintons. But as time passed, I saw how unethical the network was and remains and how particularly my female clients were mistreated and lied to. I wrote about this in my autobiography 'Whores: Why and How I Came to Fight the Establishment,' which can be found at Amazon.com or BarnesandNoble.com. "The sexual and psychological abuse foisted upon and perpetrated against Ms. Luhn, the most severely damaged of all the women at Fox News, is demonstrative of not just of the degeneracy of the now deceased Roger Ailes, but as bad its current leadership, run by a woman who enabled Ailes and then covered up his crimes: Suzanne Scott. That Scott would sell out a fellow woman to advance her career is despicable. "For the true story to be told about Ailes and his enablers at Fox News by Showtime and Blumhouse, Ms. Luhn's character must depict this cover-up, which continues to today with its CEO Suzanne Scott. But rather than making Ms. Luhn a consultant so the public will have the complete and accurate story, the defendants have illegally frozen Ms. Luhn out of consultancy and compensation for the use of her life story. This will not legally stand and justice will now be meted out." For more about this sordid and ongoing Fox News scandal, listen to Ms. Luhn's interview, also embedded below, on "Special Prosecutor with Larry Klayman," a nationally syndicated radio show on Radio America.